Colin Powell is a true American hero. So you should say something like: "Thank you, my dear friend, this will bind us, and our two countries even more closely," he said. Also, be country-specific. Whenever you get something from the French, for example, "bring up the Revolutionary War," Powell recommends, and how much the French help meant to us. Praise the gift, Powell advised, by saying things like: "This will occupy a treasured place in my office." That can be a little tricky, he cautioned, especially if the giver happens to come to town and see that the gift occupies no place at all. It's hard for these dignitaries to find a place, in particular, for all the portraits, which themselves contain multitudes: once, the Palestinian Authority "gave President Obama a painting of him juxtaposed with Abraham Lincoln." Because these Global Guts Visual-Arts Surprises are often draped before their public unveiling, Powell suggests having an aide take a look in case, as has happened in his own portrait-receiving history, Portrait You bears an unexpected resemblance to (1) Count Dracula (2) Emperor Hirohito or (3) Hosni Mubarak. It would not suit to have such things on display in one's office. The solution, of course, is to put 'em in the hot tub room. "Yes, Loop fans," says the Post. "Powell has a hot tub room." 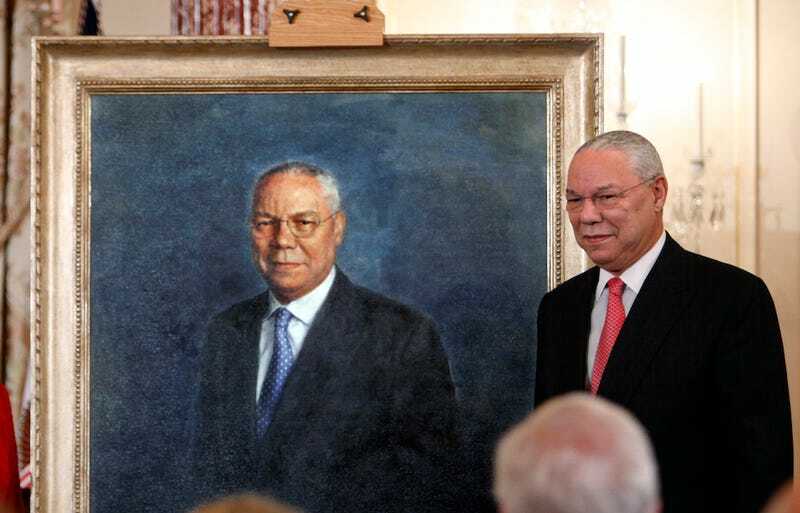 What does Colin Powell do in his hot tub room, aside from stare at foreign-born renderings of his own face? Do you think he makes himself a snack tray? Do you think he reads his Kindle whilst luxuriously soaking except for that one time he dropped it in the water and was like "AHHHH, I was almost done with Where'd You Go Bernadette?" And then all the Colin Powells in the hot tub room chortled, and all was right with the world.